“The Pleasure of Company: A Ghost Story,” is the last story in my collection, Birds of a Feather, published by Wiseblood Books. It is set in Tuscaloosa, Alabama in 1880, when ghosts from the Civil War still roamed in the heads of some who served as soldiers. To say that war changes a person is surely an understatement. The ghosts of any war linger for a lifetime in the heads of those who fought it—-and some, like the soldier and his wife in this story, find the ghostly battles of the mind even more ominous than the war itself. Except, this is also a love story; one in which the opportunity to forgive an enemy (which might be oneself) is offered, but you’ll have to read it to learn whether that opportunity is actually taken. Click on the book cover to order the book. A year ago, when she could not bear to speak to a soul, when she did not comb her hair or wash her face or dab herself with lavender water, or wear her corset (because any underclothing cut off her breath), Julia began the night walks into the woods, taking off her gown and lying upon the ground beneath the ancient oak. But neither the cooling breeze upon her breasts nor the sparkle of stars kissing the leaves to silver against the dark sky lifted her melancholy. The night walks have become her futile attempt to make sense of meanness. Still Julia cannot fathom a reason for the death of her child; still she has no face for Hattie’s murderer. “It’s been a year, exactly,” Joseph says, motioning Esther to begin. He is tall and thin, with a once pleasant face, now pinched by sorrow and the worry of a much older man. The old black woman, Julia’s childhood nurse, carefully lifts the customary black satin from the mirror on the dressing table. The light causes Julia to shut her eyes and lower her chin into the high-necked collar of her funeral dress, made from the same bolt of satin that covered the windows and mirrors. Every night, Esther washes and irons it for Julia because she’ll wear nothing else. “What if Hattie’s spirit has been trapped behind the mirror?” Julia asks. Clara and I hear and understand his thinking; that the only trapped spirit is Julia’s, and he desperately wants to help it escape. He motions Esther out of the room so he can be alone with his wife. In the uncovered glass, her unkempt brown hair hangs about her oval-shaped face. Her narrow shoulders slump forward and her opaque eyes, once buoyantly blue with the promise of a happy life, are as tarnished as neglected silver. He has to do something meaningful soon, before he loses her forever. Yesterday, he suggested a dinner party. Once, she loved celebrations. “The dinner party is what you need, Julia,” he reminds her. “You’ve not had the pleasure of company for more than a year.” He bends to kiss her cheek, but she shies away from him as she has come to do, giving a bitter wince at the touch of his fingers on the nape of her neck. A dream is spiritual aspiration. I have often been called a dreamer. My father was the first to label me so. That’s because he was a dreamer, too, and understood. He understood that life would be hard, and that no one can get away from that truth. He understood that imagination and persistence is required. He understood the knocks of life, and afterwards, the joy that comes from achieving a dream. He understood experiencing the small hurts, and even the great pain called for, in exchange for something of greater importance. In other words, my father understood that life for each of us holds a Crucifixion. So, do we have to lose to win? We cannot get away from personal suffering in this world. We are not infallible even if we sometimes believe we are. But there is purpose in it, something of greater importance. Out of our pains, sufferings, and sacrifices comes a victory. Perhaps it is not quite the dream we put our finger on, but even better. To dream, to want, to aspire is part of our spiritual nature, given by God, and role-played for us by his son, Jesus Christ. What did God want so much that He would allow his son to suffer crucifixion? He wanted to accomplish a spiritual purpose. Our redemption. But it’s hard to accept a cross, much less carry it with hope. I don’t even like to think about it. This is where God’s grace comes in, allowing us to get through it and continue on. I have been changed by books I’ve read, and I’ll bet you have, too. I’ve thought about the characters and their motives, their place in time and how that affected them. I’ve wondered about the author’s reason for creating a certain character, and what he/she wants the character to impart to the reader. All handled by authors who have something very particular to share with readers. And I’ve judged books as by this criteria: Do they speak of the good, truth, and beauty of our world? By this, I don’t mean that the book must be anywhere close to squeaky clean. Sometimes these things are only apparent when a story accents the lack of them. Story comes from Christ himself–history is His story. Christ teaches through stories, through fiction, such as The Prodigal Son. A work of art, a story told by Jesus Christ. We see something of ourselves in the story, either in the forgiving father or the wayward son. Something that moves us, even changes us. The evangelizing power of literature has been sanctioned by Jesus, himself–Joseph Pearce. Below is his full talk, “How Literature Shapes the Christian Character.” It is well-worth hearing–especially for writers–but in case you don’t have time to watch, here are some major points. First of all, our imagination is the image of God in us as the creator. We are called to be creative. The Christian character can be defined as the Good, the True, and the Beautiful. Even if we don’t do it well, it’s worth doing–in life and in our creative efforts, be that writing or something else. We are given talents by God to be used. God does not remove the gift just because we abuse it. Many times we start doing things badly in order to do it better, but we won’t do it better until we continue doing it badly. Practice makes perfect. So, we must keep creating, keep writing. “The Lord of the Rings” is unadulterated Catholic ideology. God becomes man on the Feast of the Annunciation–same day the ring is found. The ring is synonymous with sin–the person wearing the ring fades, which is the addictive quality of sin. Certainly NOT comparing myself to Tolkien, but my own writing is based in Catholicism, as well. My characters may not be Catholic, they may even be enemies of the church, but regardless, they are all human beings, created in God’s image and likeness, living in a world in which God’s presence is infinite, and available to all. WHY DID I DO THAT!?? Every action has a consequence. Do we consider the consequence before we move ahead? Our lives are rambling questions. Daily we make decisions, acting from our motives–our reason for doing something. That ‘something’ may be good, not-so-good, or just plain evil. A good motive is easy to see. A not-so-good motive is often easy to understand, as well. But it is rare that we can actually understand a truly evil motive. This is because we were created to be good–in God’s likeness, not Satan’s. BUT…the Evil One (And yes, Satan is real) fiddles around with our motives, tells us that what we know we shouldn’t do, or have, is good for us. And because we are human and possess God’s gift of free will, we often excuse evil. Satan is all about self, and selfishness is his motive; the same motive he polishes up in us. And when he’s polished it enough, when we think we need his kind of good, then he can sell us anything. Let’s talk about “need.” I spent twenty years in advertising; a cardinal rule is to find a need in the potential buyer, then create a campaign focusing on something that appears to fill that need, then put the cherry on the top with a deal that is too “good” to pass up. Making something appear too good to pass up is Satan’s way, as well, and judging by his success rate, no one can fool a vulnerable buyer better than Satan. So, we let ourselves be pulled toward the good Satan presents to us, and then….we buy it. We become poison to those around us. We try to lead them to our way. We don’t need God. In fact, we pitch Him–our Creator–out of our lives and start to think of ourselves as God. This is why it is so important to guard the goodness God created in us by looking at the true motive behind everything we do. Is the action we are going to do in line with our Faith in God–or is it only Satan’s ploy? Whole societies cannot love whole societies, unless love first begins and acts in a singular heart. Love is a thing of beauty, and of spiritual purpose, not a tossed-about bone of hypocrisy that looks good in letters on signs used in the six o’clock news. Our ability to love is how we human beings share in God’s divinity. How we carry out that ability has a great consequence. Love is not meant to be denigrated, not meant to be used for a lesser, and yes, hateful purpose. Love is purpose, itself, and it can only be had within the context of TRUTH. The way the word Love is being used today is a bastardization of TRUTH. A bastardization of our Creator, our God. The true, sacred meaning of love is being debased by those who are anything but loving, and only use the word in a self-interested way. Is it loving to scream and spit at a fellow human being because you don’t agree with him/her? Is it loving to set out to destroy another person? Is it loving to demolish what belongs to others? Is it loving to misconstrue (lie about) events for your own personal gratification, or personal agendas? This is puffed-up self-importance, when there is only one way, and it is MY way. An election was held. The majority ruled. Misplaced pride and unwillingness to play fairly will not only back-fire, it will greatly harm America. Right now, the water is wide between two factions in our country, but TRUE LOVE, not hypocrisy, is our boat, the vessel which will carry us across the ocean of our differences. Our Very Personal ONE Life…. What are your convictions? The principles you live by? If you were asked to list them, could you? And if you can list them, would they be honestly YOURS? Or would the list be only the opinions of someone else? We need to have well-formed, personal convictions that we will stand up for, regardless of danger, embarrassment, or our own timidity . How do we get that? Oftentimes, our convictions come from our family upbringing. We develop ideas from the ideas of our parents. Of course, many of us discard those convictions as we get older, believing them old-fashioned, or out-of-date in a fast, high-powered world. Today, many of the principles we once lived by seem to have been thrown out the window and traded-in for popular opinion. We don’t want to appear different from others, so we look at media personalities and take on their personas rather than develop our own. Why do we do this? Is it because creating convictions requires deep thought and we simply don’t have, or take, time to do that? We have little silence in our world. And the multitude of noises that daily assault us don’t allow for much critical thinking. Well, we have to make time. Carve it out of our day; it’s that important. Because our thoughts always precede our actions. Our thoughts present us with a choice, and our choice is based on the convictions we hold. Each of us as an individual is so very important to life itself. We may not think we are, but we are part of a plan in the mind of a God who loves us. He has given us a part to play in this world that He put us in. In this time, in whatever place we are, our convictions are important. Indeed, the strong convictions of even one person can better the universe in ways we may never suspect or understand. Let’s think about our convictions. Let’s not be without principles. Let’s not be afraid to stand up and to act on them. Let’s not be wishy-washy about what we believe. People disagree. But God allows for heart-felt belief on every side of any issue. He expects that we will have thought about it though. In fact, I believe He demands us to come up with our own personal, but well-formed, convictions, and then stand up for them in order to help ourselves, and others. Won’t you stand up you girls and boys? Saint Valentine’s Day is a wonderful opportunity for us to show how much we care about those we love. Children especially enjoy the holiday–cut out hearts, candy, school parties. I remember when my mother was a “home room mother,” and she presented a word game for our class: How many other words can you make out of the letters in VALENTINE? The prize was a big chocolate heart wrapped in red cellophane paper–to me, it was beautiful and I wanted it–bad! I wanted to give it to my Daddy. Ed was a quiet, skinny child being raised by his very old grandmother, whom he loved very much. She was the only family he had. No one knew where Ed’s parents were. He and his grandmother lived–as they said back then, on the ‘other side of the tracks.’ And they didn’t have much. He wore the same pair of pants everyday and only an occasional change of his shirt. Still, he was by far the smartest child in the class, almost always 100’s on his papers. But give up the heart for Ed? Oh, what a decision! And my mother knew I didn’t want to make it. Then, my mother whispered, “He wants it for his grandmother, sugar.” Okay. Well, I wanted it for my daddy. “And I do have another heart just like it at home, and it will be yours.” The deal-clincher. So I watched Ed light up like a Fourth of July sparkler when it was announced that he won the prize. On the way home from school, my mother smiled at me and said I’d done just what Saint Valentine would have wanted me to do. Of course, I was out nothing, really–another heart waited for me at home. That night, after I gave the beautiful red cellophane wrapped gift to my Daddy, I pictured Ed and his old grandmother eating the other chocolate heart, the heart I’d won. And I thought a little bit about what loving someone really means. Here’s a little history on St. Valentine. 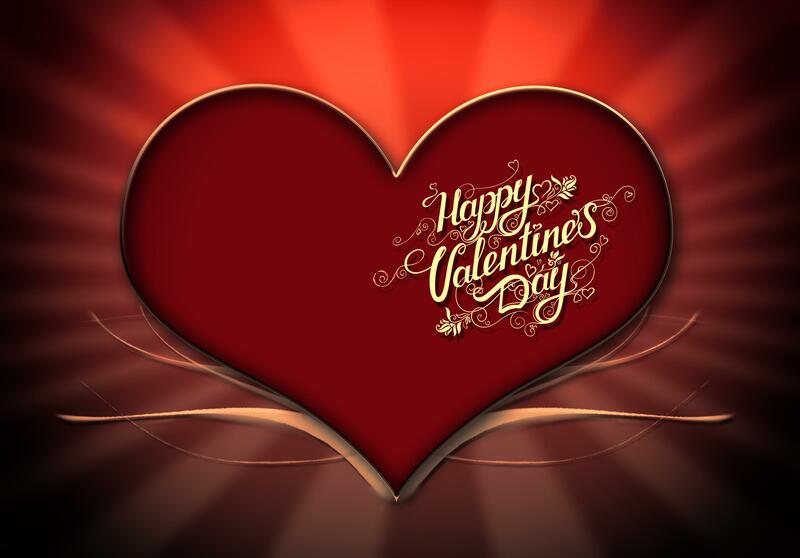 Happy Valentine’s Day to all those I love–especially, Pat, my son-in-law , whose birthday is today. And to ‘Ed,’ who grew up to be a fine Jazz musician. A few years ago, in the Fall, my husband and I sat on our boat dock when the moon was at its fullest, its reflection floating on the dark surface of the lake like pieces of a silver puzzle. On both ends of the dock, where posts held up the metal roof, were spider webs lit up by the moonlight. One of the webs was strong, but delicate-looking, and classically precise; an ever growing circle, attached symmetrically by what must have been a ‘craftsman’ spider. The web was beautiful, in fact, it was perfect. The other was a ramshackle sort of web, attached in a haphazard way to the post, almost like the run-down house of a derelict drug dealer. Loose strands hung from it, and there was no discernible circle to the web at all. The spiders spun their webs to catch night bugs attracted to the lights on the boat dock. You might think that the classically perfect web would catch more bugs. No way. Not so. 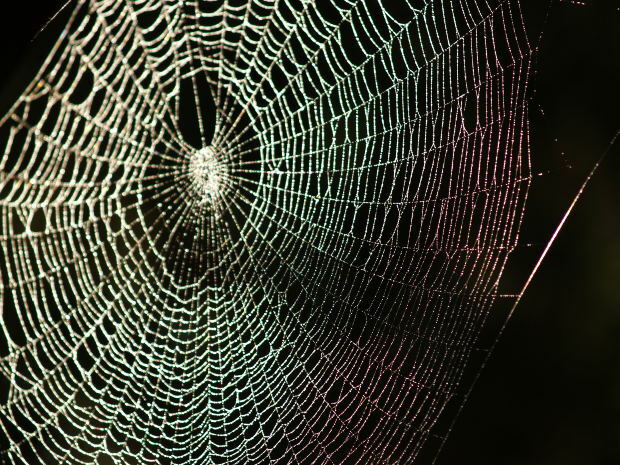 The derelict spider’s web was literally covered in trapped insects, while the craftsman’s web had none for a long while, and then only one or two. Still, night after night, the craftsman spider kept spinning and spinning, while the derelict one chomped on its plentiful catch. I admitted that human beings have similar experiences. The most diligent worker isn’t necessarily the one who succeeds first. But if he continues to be persistent, success often comes. Being an born optimist, I fully expected the situation to change for the diligent spider. Except night after night, the same thing happened. The derelict spider kept catching the bugs, and the diligent one kept spinning, but with no result in the bug department. Then one day, a tornado hit across the lake. And on our side, trees were felled and boat docks blown about. After it was over, we went to look at any damage done to the dock. There was none. The only thing different was that the derelict web had vanished. Amazingly, the diligent spider’s web still hung, not quite as perfect, but it had survived. And that night, it was filled with bugs. There are many morals you could attach to this story: A house built with a good foundation will last; or don’t take the quick way. But for me the most relevant is: Be true to yourself. You are a child of God, so never underestimate what He will do in your life if you keep the faith — no matter your age! Not long afterward the tornado hit, I found a literary agent. She didn’t last long, and my book wasn’t published right then. More waiting. But I’d taken my lesson from the finely crafted web and kept spinning like the diligent spider. And was finally published by a small company, and then a book of short stories by another small press. Just enough to keep me going! Now, I’ve written more books, and looking for publication. I am still keeping the faith, hoping my diligence will produce results.